What kind of prophet was Jesus? Was he the Messiah? "Son of God"? "Son of Man"? What's that about? How are God and Jesus related? Can they both be God? The gospel--how could God dishonor his Son by letting him die horribly? What good did his death do? Aren't the Bible's accounts of Jesus corrupt? 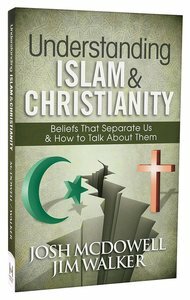 With all this, as well as backgrounder appendixes on the basics, believers will have authoritative evidence from Scripture and history to intelligently deal with Muslims' questions about and challenges to Christianity. About "Understanding Islam and Christianity"
Walker is Senior Pastor with the Evangelical Free Church.